âNo longer will St. Martinâs Secondary School be looked at as the school that was or the school that used to be, but we will rise again,â said Auguste, at a media launch of the institutionâs 50th anniversary, on Thursday, February 10. St. Martinâs Secondary School will mark the milestone on Thursday, November 3. Auguste disclosed that the school will be hosting a list of events leading up to the anniversary. The anniversary celebrations began with a Holy Mass on November 18, 2010. However, April this year will see the launch of school T-shirts, ties, and a school ring. The studentsâ talent will also be on display come June, when a concert will be held at the Peace Memorial Hall. Mention was also made of plans to erect a statue of St. Martin in the schoolâs yard. The institution carries the name of this Saint. 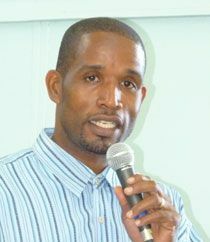 Past student Ronnie Daniel, reflecting on some of his experiences at the school, said that his alma mater rivalled the Girlâs High School (GHS) and St. Vincent Grammar School when it came to academics and sports. He recalled that the school was even crowned champions of the J.G Agencies Secondary Schools football tournament in the early 90âs. âIt was a time of joy and excitement and this school has done tremendously well in a short space of time to build a reputation,â Daniel remarked. Daniel urged students and past students to spread the word about the schoolâs anniversary and implored them to work hard in order to preserve the schoolâs history. Carlton Hall, Senior Education Officer in the Ministry of Education, reminded the students about the days when the Common Entrance examinations was a selection process based on studentsâ performance. He said that some parents whose children were admitted to the St.Vincent Grammar School passed on their place there and sent them to St Martinâs. Hall congratulated the school on its milestone achievement and implored the school body to keep up the institutionâs legacy. Other addresses came from Dean and past student Paul Roberts and Ercelle John, Vice Principal, while a musical rendition was done by past student Dexter Bacchus.